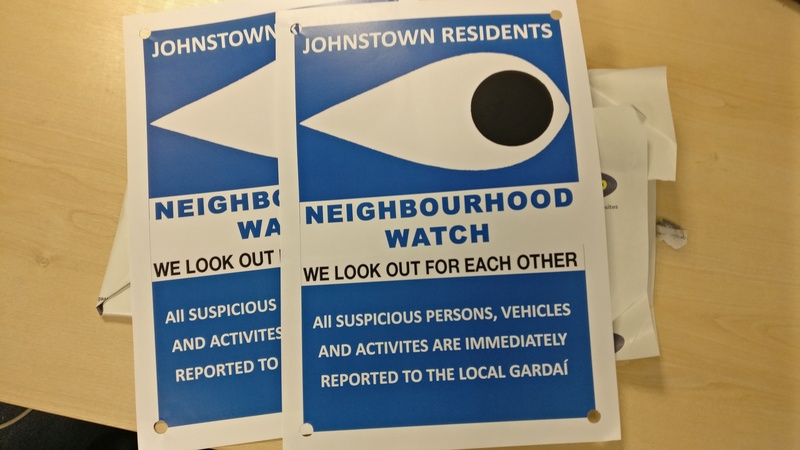 It will be firstly to alert people of break ins and secondly to make people aware of any suspicious activity or important JRA information. If you want to participate, please email your Name, Address and Mobile phone number to info@jra.me. Dont forget to tell us which you want to be added to 1) Viber OR 2)Text Message group! Finally, we ask that messages comply with standard digital etiquette and common sense. As we note that other Viber groups, such as parent school groups, often go off topic or are misused. 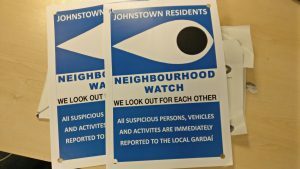 NEW Neighbourhood Watch Scheme Planned but we need your help! 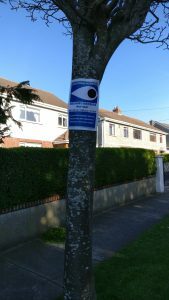 A start towards a safer estate, is communicating amongst ourselves when there is suspicious activity or an incident has occurred. So we are looking to establish a Text Alert System amongst residents and we will need at least one person per road. Once we have a network of contacts throughout our 21 roads, they will be a conduit for alerts for their fellow neighbours. Once we have at least one contact for every road, we will have a starting point! We need to have that network first and then we will agree a plan of action. This is a Senior Alert Scheme plus the Care & Repair services which are available for those residents 65+ living in the area. 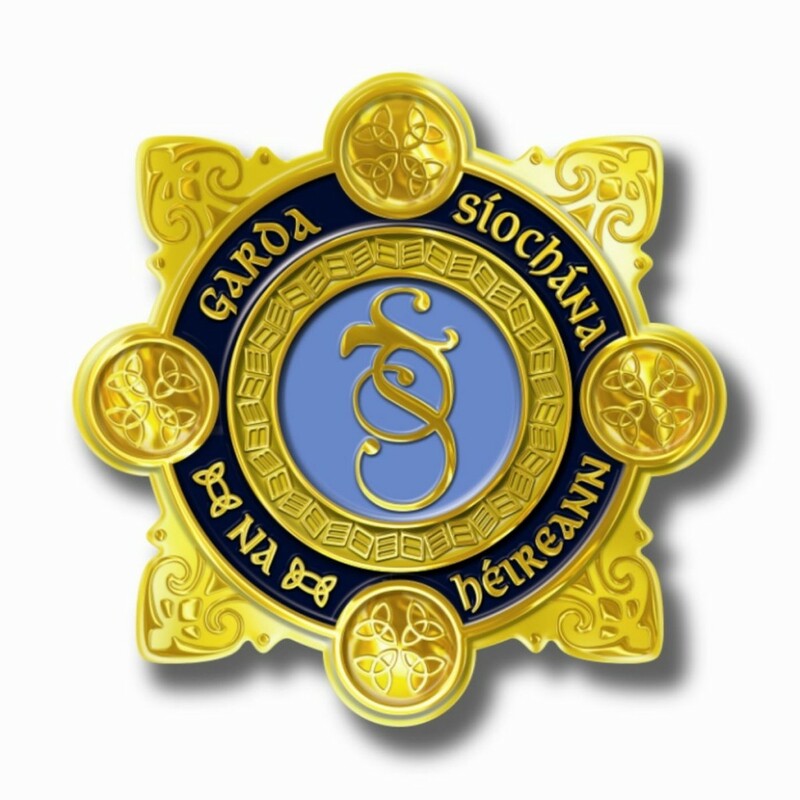 Information below is from the https://www.garda.ie website. 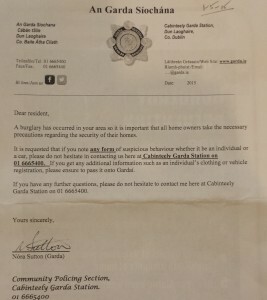 More details on https://www.garda.ie/en/Crime-Prevention/Securing-your-home/. There are a lot of downloads at the bottom of the page. Jewellery and cash remain the most common objects stolen, with €600 being the average value of goods taken. Computers, mobile phones, TVs and games consoles are also among the top items stolen. Having your home burgled is a distressing and traumatic experience. An Garda Síochána is hoping that by raising awareness of some simple crime prevention measures, such as locking up and lighting up, less Irish families will have to endure the pain of being burgled. 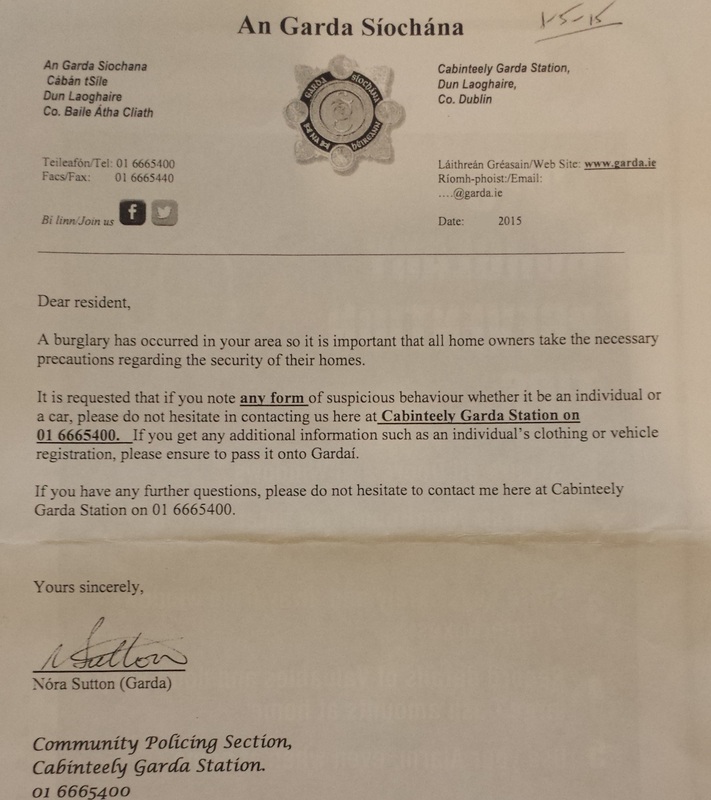 If going out, Irish homeowners should endeavour to make sure their home looks occupied – to Lock Up and Light Up. Use timer switches to turn on lights, lock all doors and windows, store keys away from windows and letterboxes, and use your alarm. Taking these simple steps will lessen a home’s vulnerability, deter burglars and protect homes. 5. Consider turning off the location sharing setting of your phone’s camera app. • Failing to keep garages and sheds locked. Not only do they contain valuable property, but also tools which may help the burglar gain access to your home. Burglars prefer to enter homes through a door because, if disturbed the open door provides the quickest escape route. • proper fitting and installation. If you are replacing your doors, you should consider doors that have already passed stringent security tests, such as PAS 24 2016, or for higher levels of security, doors meeting Irish & EU Burglar Resistant Security Standard IS EN 1627:2011. Additional locks and limiters may be added for extra security. Remember to lock your doors. One in five burglars will enter a home via an unlocked door or window. 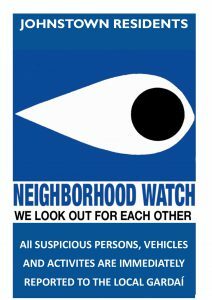 • The visibility of the window to neighbours or passers-by. We can reduce their attraction as an entry point for the burglar by trying to minimize these risk features. Windows manufactured to comply with the European standard I.S. EN 1627:2011 or the British security standard for doors & windows PAS 24-2016 or equivalent are recommended as these will have been subjected to specific security and burglar resistance tests. Additional locks and limiters may be added for extra security. Remember to lock your windows. One in five burglars will enter a home via an unlocked door or window. It is widely accepted that appropriate lighting can help to reduce crime and act as an effective deterrent to burglars. Appropriate lighting will help to make your home more visible to neighbours and passers-by; thereby increasing the likelihood of discovering unwanted intruders and trespassers. Lighting also helps to reduce the fear of crime. It is widely accepted that intruder alarms are an effective deterrent against burglars, thereby helping to reduce the likelihood of your home being targeted. However, it is important to understand that an intruder alarm is not a replacement for good physical security. It should, rather, be regarded as a back-up to good physical and other security measures and precautions employed to protect your home. All installed alarms should comply with the European Standard EN 50131. All alarm installers and installation companies must now be licensed by the Private Security Authority. A list of all licensed installers is available on their website. It is important to understand how your alarm system operates. Your installer should explain the operation of the system to you and all other members of your family. Insist on a training session to demonstrate its features. Do not write alarm codes etc. on the instruction manual or on walls or doors near the control unit or keypad. When we think of crime prevention and how we can secure our homes we often forget to consider our gardens and everything in them. Your garden contains valuable possessions that thieves can easily sell; thieves can also use implements found in the garden to break into your home. 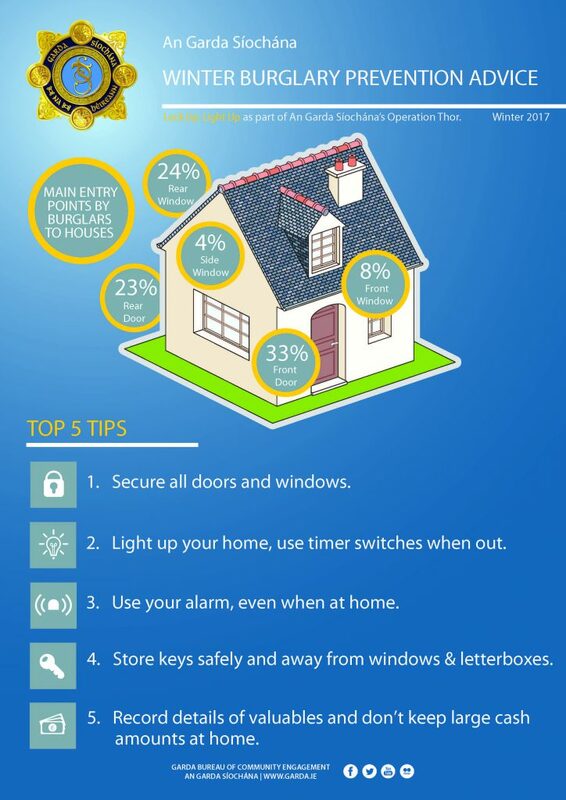 By taking some simple precautions you can reduce the risk of being burgled, increase the security of your home and garden and make life more difficult for any would-be intruders. associated with aging can make older persons feel vulnerable and more fearful of becoming a victim of crime. We are a go! We now have our signage up at all key points in the estate.